Part Used & Method for Pharmaceutical Preparations: The bark of the root is gathered in summer or autumn and then dried in the sun. Functions: 1. To dispel wind and dampness; 2. To strengthen the tendons and bones; 3. To benefit urination. 1. 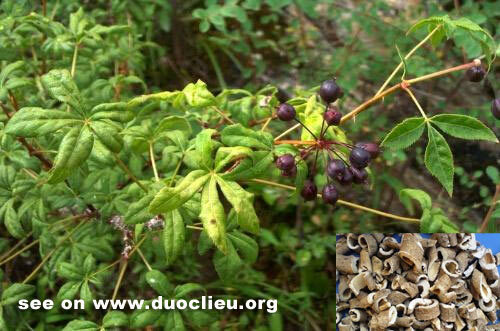 Wind-damp obstruction syndrome manifested as rheumatic pain and spasm of the limbs: Acanthopanax bark (Wujiapi) is used alone or with Clematis root (Weilingxian), Pubescent angelica root (Duhuo), Mulberry twigs (Sangzhi) and Chaenomeles fruit (Mugua). 2. Deficient liver and kidney manifested as soreness, weakness and pain in the lumbar region and the knee:. Acanthopanax bark (Wujiapi) is used with Eucommia bark (Duzhong), Cyathula root (Niuxi), Mulberry mistletoe (Sangjisheng) and Teasel root (Xuduan). 3. Edema: Acanthopanax bark (Wujiapi) is used with Poria peel (Fulingpi) and Areca nut shell (Dafupi) in the formula Wupi Yin.